Adam Gase will be conducting two head coach interviews this week. After his Cardinals meeting, Gase will head to the Big Apple to discuss the Jets’ HC vacancy, Jeff Darlington of ESPN.com reports (on Twitter). The recently fired Dolphins coach will meet with the Jets on Friday. He is currently in Arizona for the Cards meeting. After the Dolphins cut the cord with Gase on Monday, word quickly surfaced other teams were interested in sitting down to discuss the three-year Miami head coach’s qualifications for a quick rebound. While the Broncos and Browns passed on that prospect, the Cardinals and Jets will not. And the 40-year-old coach is in the thick of another coaching carousel. Gase’s career took off when he enhanced the Peyton Manning-era Broncos offense, leading the 2013 team to an NFL scoring record. An injury-plagued Manning also threw 39 touchdown passes a year later, but the Broncos pivoted toward Gary Kubiak, routing Gase to Chicago. 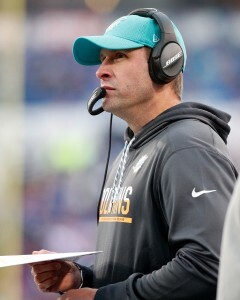 He became the Dolphins’ HC in 2016, but despite rumors he would be safe and get a fourth season leading the Dolphins, Stephen Ross kept front office fixtures Mike Tannenbaum and Chris Grier, with some job-title reorganization, and axed Gase. The Jets are also set to interview Mike McCarthy, Eric Bieniemy and Kliff Kingsbury. New York requested summits with Kris Richard, Todd Monken and Iowa State’s Matt Campbell, the latter of whom turning down the Jets. But a fourth confirmed interview appears to be in the works. Jets should pounce on him. My Dolphins moved too soon on his firing. The qb’s in the AFC playoffs this year are Brady, Mahomes, Rivers, Luck, Watson and Jackson, a guy the Dolphins brass passed on. Does the Dolphins really think they should be in the playoffs with a qb like Ryan Tannehill? Gase is a smart young coach who wrung what he could out a lousy hand in Miami. The Jets should pounce on him.